This Foil Pack Salmon with Grilled Pineapple Salsa needs to be the star of your next summer bbq. 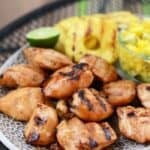 This healthy meal is made in under 30 minutes on the grill and full of fresh flavor! , which is available on Amazon Prime, meaning you could have this baby in your arms in less than 2 days. Could life really get any easier? Yes it can because this grill heats up in less than 2 minutes. 2 minutes. (I swear they’re not paying me to say this, I just love it so much). We are back with another amazing salmon recipe thanks to our friends over at Surrender Salmon. Remember this post? I basically explained why Linley and I are obsessed with SS…don’t make me do it again. We actually just heard from the founder, Grant, that he is leaving Minnesota for Alaska next week to catch this year’s crop! The next time we cook with salmon it’s going to be with fresh, Alaskan salmon that’s as perfect as can be. This recipe rocks my world because you just slather up your salmon with buttery goodness and then seal it up in a foil pack. It’s herby. It’s easy. It’s fast. 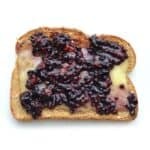 And it’s delicious. Not to mention that the grilled pineapple salsa on top might be the best salsa we ever made. 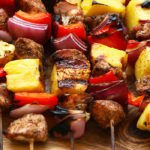 If you make this recipe promise me that YOU WILL MAKE THE GRILLED PINEAPPLE SALSA. I promise that is something you don’t want to skip out on! Preheat grill to 400ºF. Spray a large piece of tinfoil with non-stick cooking spray. Set aside. Prepare salmon filets by patting dry with a paper towel and seasoning with salt and pepper. Then, mix together softened butter, cilantro, garlic, salt, and pepper in a small bowl. Spread the butter mixture on top of the salmon filets and transfer onto tin foil. Then, squeeze on lime juice. Fold the top half of the tin foil over the salmon and pinch sides together. Make sure there are no holes where air can escape. Grill at 400ºF for 8-10 minutes* or until fully cooked and flakey. In a medium size bowl, mix together onion, cilantro, cherry tomatoes, jalapeño, apple cider vinegar, and lime juice. Place in the refrigerator for later. Prepare pineapple by coring and slicing into strips. Season with 1/2 tablespoon of chili powder and about 1/8 teaspoon of salt. Grill pineapple at 400ºF over direct heat for 12-15 minutes, rotating every 5 minutes. Remove from heat, let cool, and then cut into small chunks. Add pineapple to the rest of the salsa ingredients and mix well. 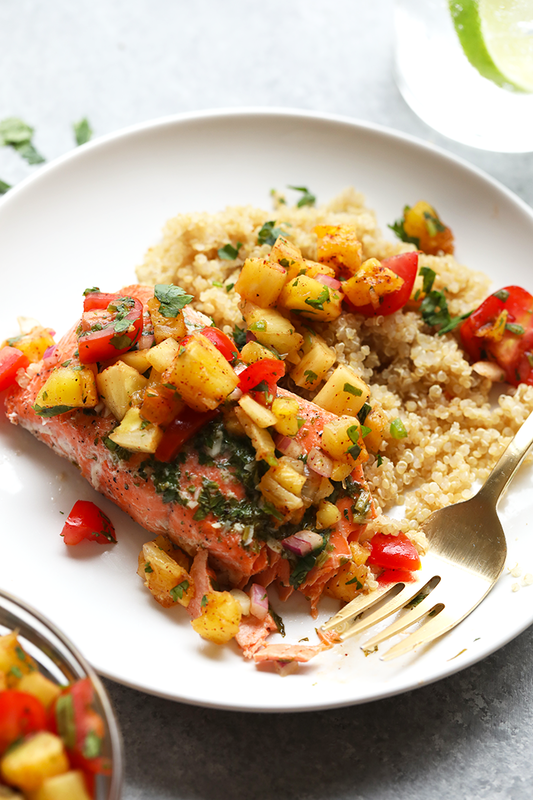 Serve salmon with grilled pineapple salsa and grain of choice (we chose quinoa!). *You can also bake this in the oven at 400ºF. **Cook time varies based on the size and thickness of the salmon filets. PS: In August, Linley and Cole invited us to join them on a little camping excursion with a few other couples in Goosebury Falls up north. Can you guess what we’re making? 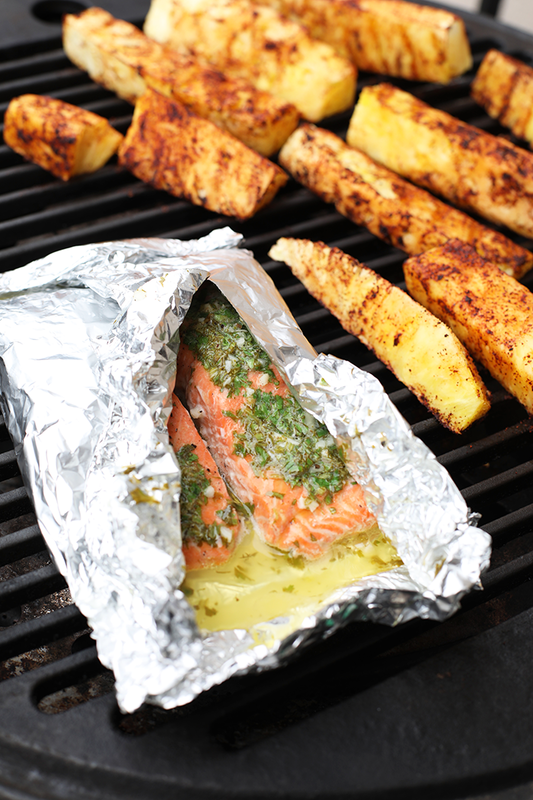 This Foil Pack Salmon with Grilled Pineapple Salsa. Yes sir!